the larger island was much less populated and much stranger. stranger in this way: there were exotic animals everywhere! we ran into a flock of llamas - on an island! in Maine! My sister and Delilah and I visited the two largest islands: Little Cranberry (also known as Islesford, an artist colony) and Great Cranberry which is where all the unusual animals are. I highly suggest a roadtrip. You *have* to check out "No Fear No Die" by Claire Denis, one of my favorite film directors. Isaac deBankole is terrific as a sympathetic cockfighter. 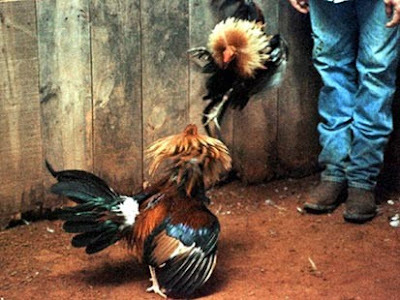 Also, we kept chickens growing up and I was often terrorized by a rooster tall as me!